Louisiana Secretary of State Tom Schedler accepts Spirit of '45 National Leaders Medal. Louisiana was the first state to proclaim Spirit of '45 Day. Delegates representing dozens of organizations that participated in the 2010 National Spirit of ’45 Day campaign came together in Baton Rouge, Louisiana on February 25-27 to share their experience and ideas, develop best practices, and define strategies for building on the last year’s success in 2011. The 3-day program included highly interactive working sessions and lots of Southern Hospitality served up by Maury Drummond, Executive Director of the USS KIDD and his staff, who rolled out the red carpet to welcome their guests to Baton Rouge. Maury and his team were among the first in the country to embrace the idea of observing an annual day of remembrance and national unity to honor the men and women of the WWII generation. Cindy Bishop, the State Director of HOBY (Hugh O’Brian Youth), was instrumental in helping spread the word about Spirit of ’45 and helping youth organize events on August 14 in several cities in Louisiana, which was the first state to officially recognize “Spirit of ‘45” last year. The Conference coincided with the anniversary of the commissioning of the KIDD in February 1943, and the beginning of the year that will mark the 70th anniversary of the death of its namesake, Admiral Isaac Kidd, who was killed when the USS Arizona was sunk during the attack on Pearl Harbor. Attendees came from as far away as Hawaii and California, and included senior executives from Spirit of ’45 national sponsoring partners VITAS Innovative Health Care, U-Haul, the US Navy Foundation, and the AMVETS California Service Foundation. Several history museums sent representatives, including the Historical Navy Ships Association, the Harry S. Truman Presidential Library, Battleship New Jersey, Veterans Museum of San Diego, History San Jose, and Naples Backyard, as did Bugles Across America and the American WWII Orphans Network. Dignity Memorial, whose network of funeral homes organized several Spirit of ’45 Day events last August also sent a representative from Nacogdoches, TX. Jim Roberts, founder and president of the American Veterans Center, flew in for the occasion and to be honored for his leadership in re-establishing the National Memorial Day Parade in Washington, D.C. which features a major Spirit of ’45 presence each year. Other special guests included Dr. Francis Carter, founder of the Association of Rosie the Riveters of America, and her husband, John, a veteran of WWII who served as a paratrooper during the invasion of Europe. 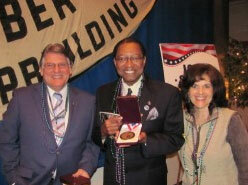 "Kip" Holden, Mayor-President of Baton Rouge Parish, accepts Spirit of '45 National Leaders Medal on behalf of mayors of America who officially supported the first national day of remembrance to honor the men and women of America's greatest generastion". Pictured with Warren Heg, National Director of Spirit of '45, and Linda Laurie, National Events Coordinator for Spirit of '45. Nell Calloway, the grand daughter of General Claire Chennault leader of the legendary Flying Tigers, also attended. The weekend kicked off with presentation of the first National Spirit of ’45 Leaders Awards to the State of Louisiana and the City and Parish of Baton Rouge, followed by the unveiling of the “Lone Sailor” statue from the US Navy Memorial that will stand at the entry of the Museum. On Saturday night, attendees enjoyed a Mardi Gras-style banquet provided through the courtesy of VITAS and live entertainment from the talented trio “United We Sing,” who were flown in by U-Haul especially for the evening. VITAS, U-Haul and the AMVETS California Department Service Foundation were honored during the evening for their ongoing support for “Keep the Spirit of ’45 Alive!” Other honorees included the USS KIDD, the Battleship New Jersey, the US Navy Memorial, the Historical Navy Ships Association, and Sculpture Foundation, in recognition of its placing the 26ft high statue of the famous kiss in Times Square for Spirit of ’45 Day last August. The conference ended with a wreath laying ceremony honoring all the branches of service, the merchant marine, those who served on the home front and the MIAs of WWII. Helping lay the wreaths were a group of Air Force JrROTC cadets from Oklahoma. During the ceremony, United We Sing sang a powerful rendition of “Amazing Grace” and buglers Ed Bilger, Raven McKie, and Blaine played “Taps”, and the KIDD ‘s guns fired a salute as a P51 fighter plane circled overhead. The conference was a catalyst for bringing organizations together that share the “Spirit” and laid the foundations for an annual gathering. 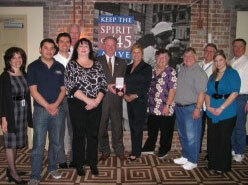 Plans are already underway to have the 2nd Annual Spirit of ’45 National Leaders Conference in San Diego in February 2012.